Are you new to Yoga Farm? Did you attend your first free yoga class? You are invited to a Trial Membership. At just $30 for 30 days, your trial Yoga Farm membership gives you all the benefits of a Sustaining membership at a discount so you have an opportunity to join our kind, nurturing, and supportive community here at Yoga Farm. In the fall of 2018 we transitioned from a corporate/for-profit model to a nonprofit charity; called ‘The School for Radiant Living at Yoga Farm’. We are asking today for you to support of our mission by choosing one of the membership opportunities below for yourself, or as a gift to a loved one. Your membership in our school will have a direct, and immediate impact on others, creating a “pay it forward” ripple effect that will benefit our local community. By joining, or continuing your membership with us as a nonprofit, you are co-creating a United Humanity with us. Your membership makes it possible for us to continue to treat the epidemic of loneliness, anxiety and addiction, in our community and beyond. 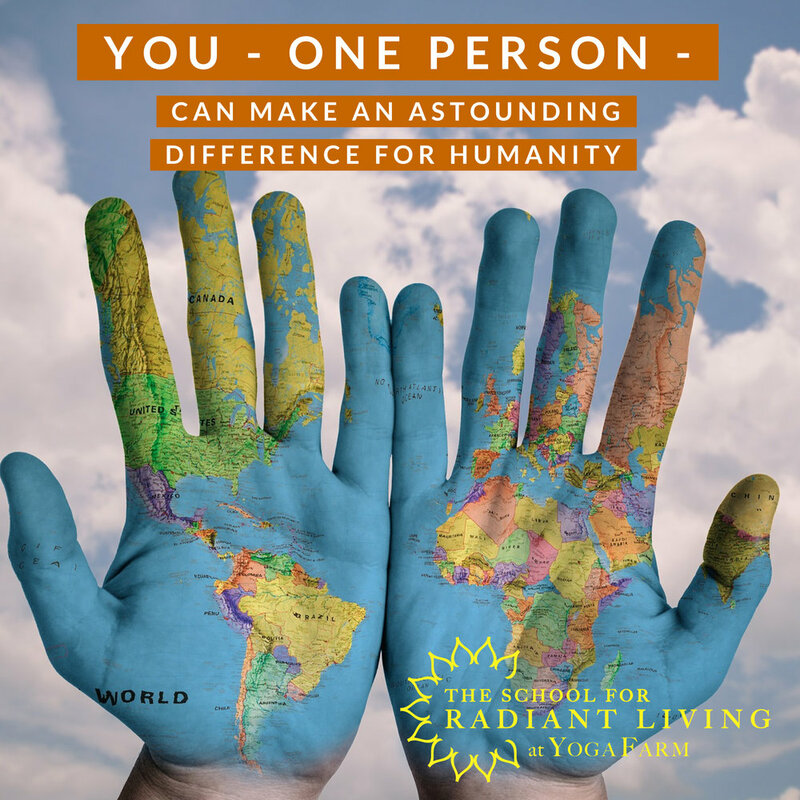 We invite your generosity and commitment to a year of membership at a level that works for your budget so that we can continue to expand the reach of this life-changing and life-affirming education, both here at The School for Radiant Living at Yoga Farm AND in our area public schools. All memberships include unlimited classes, and each level up enables us to give more to individuals and schools in our community. Choose a higher membership level today to ‘pay-it-forward’ to middle school students and others in our community that are navigating challenging life circumstances, such as cancer treatment, chronic illness, anxiety, depression or grief. The process is simple, we’ll take care of everything - start with this simple form. This membership is for those who want to support the mission of The School for Radiant Living at Yoga Farm, and also enjoy coming to classes and programs on site. This membership is for you because you know how important our work is for students in public schools (see below), you see the potential benefit to society in our mission, and you enjoy coming to regular classes. In our ‘Restoring Schools to Health’ program, we support area school districts with mindfulness education for staff and students. We are currently in three schools now, and your membership supports this vital mental health education component, that is now mandated by New York State. In one of our current programs, at Dewitt Middle School, we are teaching breathing meditations and mindfulness to 200 sixth graders every single week, and are teaching in-service seminars to the entire school staff once a month. This level of contribution is for those of you who understand the full scope of our mission and want to be an active part of it. You want to enable us to expand on the work we do in public schools, and are willing and able to sustain a membership opportunity for a less-fortunate community member (see below). A unlimited classes to another individual via our ‘Connection is Healing’ program for those navigating cancer, chronic illness, depression, anxiety, PTSD, grief/bereavement, and for full time caregivers. Connection is Healing is our offering for individuals with cancer, chronic illness, depression, anxiety, PTSD, grief integration and for caregivers. As you may know, life challenges often are accompanied by financial challenges. With your help we can give a safe space to heal, connect, and process with others. One person at a time, we can create a kinder humanity. 4. Founding Membership ~ $197/month OR 1,970/year. This membership is for you because you are ready to experience the FLOW of ABUNDANCE and gratitude MOVE through you and out into the world. You are deeply connected to the mission of HEALING the community and creating UNITED HUMANITY. You understand the possibilities of The School for Radiant Living, want to actively contribute to our growth. This membership is for those who want to support the mission and vision of The School for Radiant Living at Yoga Farm, but are not in the immediate area or already belong to a different yoga studio and community. Upon completing your membership registration, you are invited to one a 30-minute consultation over a cup of tea or on the phone with a member of our nurturing and attentive teaching staff to assess your health and wellness concerns, provide immediately applicable tools and recommendations, and develop a sustainable plan to help you reach your wellness goals. Please schedule at team@yogafarm.us. You'll be part of a community of like-minded and like-hearted people who are connecting in new ways. You will be eligible to join our private Facebook group where the discussion and inspiration continue!